This Chinese calligraphy ink stick set includes twelve ink sticks. 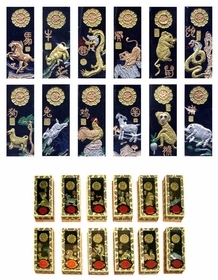 Each one features a Chinse zodiac symbol. They may be used for writing calligraphy or watercolor painting. Chinese ink sticks are made mainly of soot and glue, sometimes with scents added. To make ink from the ink stick, it has to be ground against the moistened ink stone surface in a circular manner. Depending on the desire for color intensity, the artist will dip the brush upon different areas of the stone. The more water, the less intense the color of the black ink. Wipe it clean and let it air dry after each use. Always store it in a dry place and avoid direct sunlight and draft. 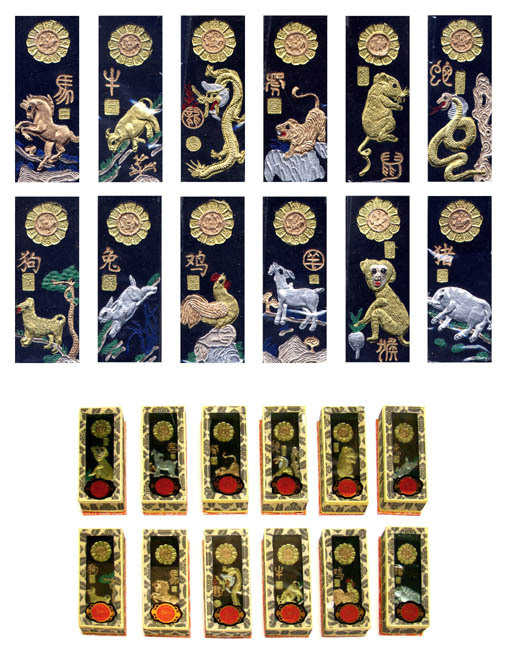 Chinese Zodiac: Legends and mythology are a big part of Chinese culture, especially in relation to the Chinese Zodiac. The 12 animals that appear on the Chinese Zodiac calendar include rat, ox, tiger, rabbit, dragon, snake, horse, goat, monkey, rooster, dog and boar. It's an unusual combination of animals for sure, and their appearance on the Chinese Zodiac is the topic of countless legends and is deeply embedded in Chinese mythology. Along with birth year animals, the Chinese Zodiac also represents inner animals and secret animals. We're probably all aware of the 12 animals or signs depicted on the Chinese Zodiac. Based on our year of birth, we understand that we're born under the sign of the Dragon, or the tiger, or one of the 10 other signs. But the truth is it's the inner animals and the secret animals that actually tell the most about who we really are and what our futures hold.